High on the hillside of Copperwood Ridge and almost hidden amongst its exceptionally pretty gardens and surrounded by an aura of blissful calm is a uniquely special house called Serenity. It was named so by Lady Lorna Howard for the sanctuary that it offered her and indeed a sanctuary it is as well as an escape into a bygone era of graceful living and conviviality. 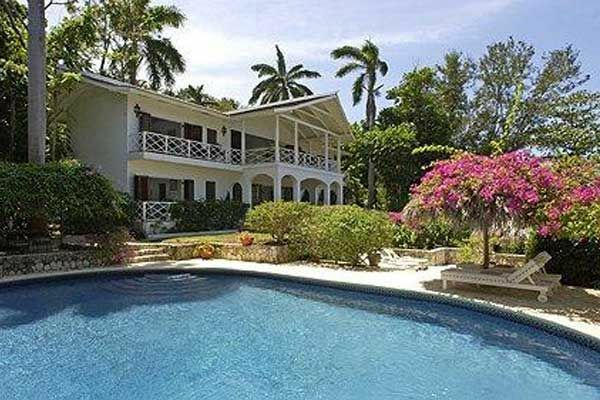 Throughout this captivating home lingers the spirit of the 1950’s, an era that represented the glorious heyday of Jamaica that was so beloved by Ian Fleming, Noel Coward and Errol Flynn. Indeed, standing at the drinks trolley on the veranda of the upper sitting room mixing a gin fizz, you almost expect one of the aforementioned to appear through the doorway and resume an interrupted conversation whilst waiting for dinner to be announced downstairs. Serenity is built in the style of a classical Jamaican Great House and stands on two levels. Much of its inherent charm and appeal is the clever integration of bringing the outside in which not only creates a restful atmosphere but allows a constantly changing pattern of light to play upon the walls. The house is entered on the upper level where you will find the elegant drawing room which exudes a delightful nostalgic air with polished wood floor, comfortable slip-covered sofas and chairs, books to read and antique oils of tropical birds. This is a room in which to entertain for not only is it the perfect size in which to do so, it also opens onto a wide veranda which has lovely views of the sea and over the immaculately maintained gardens. Tucked away off one end of the room is a little square card room that is open on two sides through wrought iron grilles. Downstairs is an informal sitting room with cool stone floor which opens onto a covered terrace with dining area. The walls of the sitting room are painted with a beautiful mural by a renowned Jamaican artist that depicts the birds and flora of the island. Leading outside from the terrace and to the right is a large oval swimming pool with spacious stone clad pool deck and beneath a pergola clad and intertwined with a garlic vine whose mauve flowers resemble those of a sweet pea is a further dining area with a grill at one end. All around are the gardens with mature trees, flowering shrubs and rolling green lawns. There are three en suite bedrooms at Serenity; two are on the upper level enjoying a sea view and louvered doors that fold completely open and one on the lower level also with folding louvered doors and lovely views of the gardens. The master bedroom which is on the upper level has a king-size bed as does the second bedroom on this level whilst downstairs the bedroom has two large twin beds. All of the bedrooms are presented in shades of white accented with pastel shades and pretty paintings. Throughout the day the shifting play of the light alters the tone of the white thereby creating an ambiance that is both soothing and timeless. The beguiling charm of Serenity is enhanced by the staff of a cook, housekeeper, laundress and gardener.